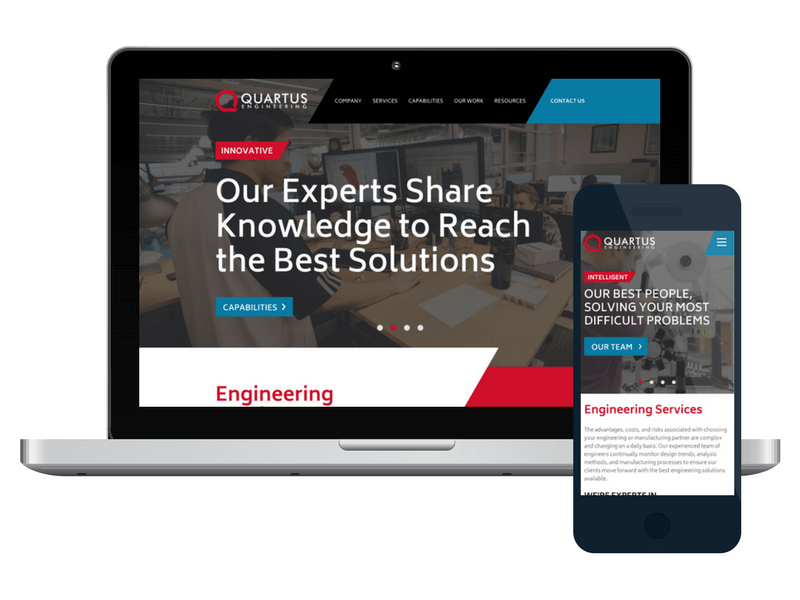 Quartus Engineering approached PINT for a branding, design, and website development project. The objectives of the project were to develop a well-recognized and differentiated brand as well as to redesign the website and marketing materials. The two main goals for the project included: generating qualified leads for the sales team and attracting qualified candidates for several job openings. By conducting an extensive discovery effort with the Quartus management team as well as Quartus customers (engineers, project managers, sub-managers, and directors), PINT was able to uncover what compelled employees to work for Quartus and clients to buy from Quartus and articulate those benefit statements through new messaging. After the discovery was complete, PINT designed and developed a user-centric website that appealed to both audience groups. Quartus Engineering was founded in 1997 to provide quality advanced engineering services. Quartus specializes in the design and analysis of mechanical systems using computer-aided technologies. They are committed to serving the needs of the engineering community in a timely and cost-effective manner. Many of the Quartus clients that PINT spoke to during the discovery process found great value in the depth and breadth of Quartus’s experience and capabilities. A rare combination, these factors not only impress customers, they play a strategic role. Clients make the decision to hire engineering firms based not only on immediate need but for potential projects in the future. The dynamic nature of Quartus’s team contributes to their overall speed, efficiency, and problem-solving ability. Customers view Quartus as being especially flexible in accepting and presenting new ideas. Customers further appreciated Quartus’s manner of communicating and presenting project data, particularly in their delivery of 3-D models. Customers spoke to the size and level of detail in the models presented, noting that the ability to “poke around” the model enabled them to more thoroughly understand the proposed solution. Additionally, it was mentioned that Quartus has a unique ability to allot resources quickly and efficiently – ensuring that projects move along at a “crisp” pace. Before working with PINT, Quartus devoted little attention to branding, messaging, and marketing. While most of the company’s growth came as a result of word of mouth referrals, Quartus knew that prospective employees and prospective clients were looking at the Quartus website as part of their evaluation process. 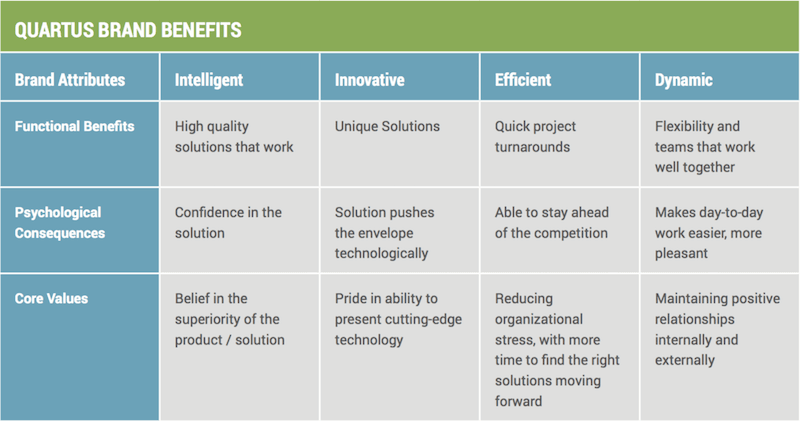 With a dated looking design that focused too heavily on aerospace industry services, prospective clients and prospective employees alike did not realize the innovation and credibility Quartus offered as well as that Quartus actually provides valuable services to other industries. In addition to aerospace, Quartus works with other disciplines such as consumer products, military defense, manufacturing and industrial automation, and optical systems and telescopes and is capable of expanding into other areas. Unfortunately, this was not well represented on the previous version of the website. 1. Communicating Quartus’s Unique Brand. In talking to internal stakeholders and some of Quartus’s past or current clients, PINT was able to uncover key brand attributes that represent and define Quartus as a company. Taking these newly defined attributes, the PINT team developed accompanying brand-specific messaging for the website, which more accurately depicts the value and personality that Quartus provides to its clients. 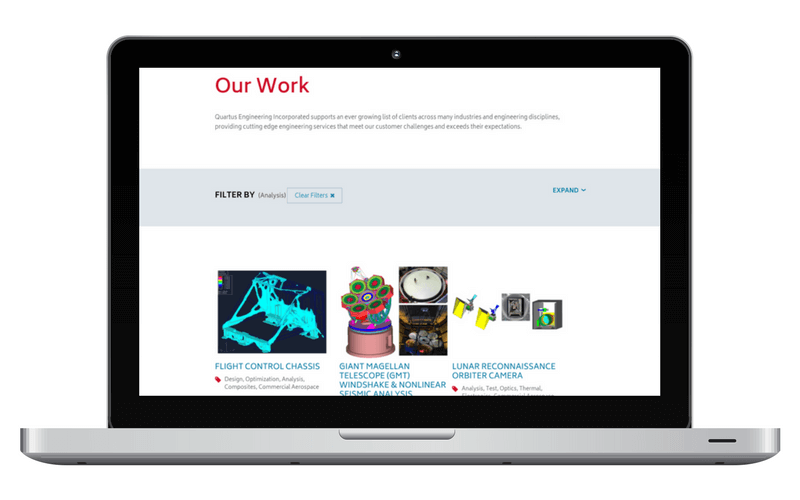 During the discovery process, PINT also uncovered elements of Quartus’s unique internal culture that is woven into the website both visually and verbally for potential clients or employees to explore and digest. Based on conversations during the discovery phase, PINT was able to translate Quartus’s unique product improvement and development process into a simple and easy-to-digest visual, which corresponds to Quartus’s services offered. Ultimately featured right on the homepage, this simple diagram achieves several goals: it communicates to potential clients what Quartus can do, and how they do it, while also helping customers identify their own needs in terms of Quartus’s services and development approach. One challenge PINT faced was how to communicate not only Quartus’s breadth of experience, expertise, and work across industries, but also how these qualities often intersect. PINT worked to develop a case study framework (See: Our Work), with a filtering mechanism to help potential clients find case studies that are relevant to their interests or needs. The filters themselves communicate the breadth of Quartus’s abilities while allowing the user the control to explore some of these unique intersections of services, expertise, and industry. PINT began the process of solving these challenges by conducting stakeholder interviews and focus groups with key members of the Quartus management team. After the stakeholder interviews were completed, PINT conducted phone interviews with seven current and prior clients of Quartus and one sub-contractor of Quartus. During these sessions, we focused on understanding Quartus’s approach and unique value as a company so that we could accurately communicate these attributes through the new site. We also focused on understanding the broader customer journey through finding an engineering partner, so that we could craft the site to answer the important questions for potential clients. PINT then took the new brand attributes, messaging, and content and developed new information architecture and design to support the company value to both prospective clients and employees. 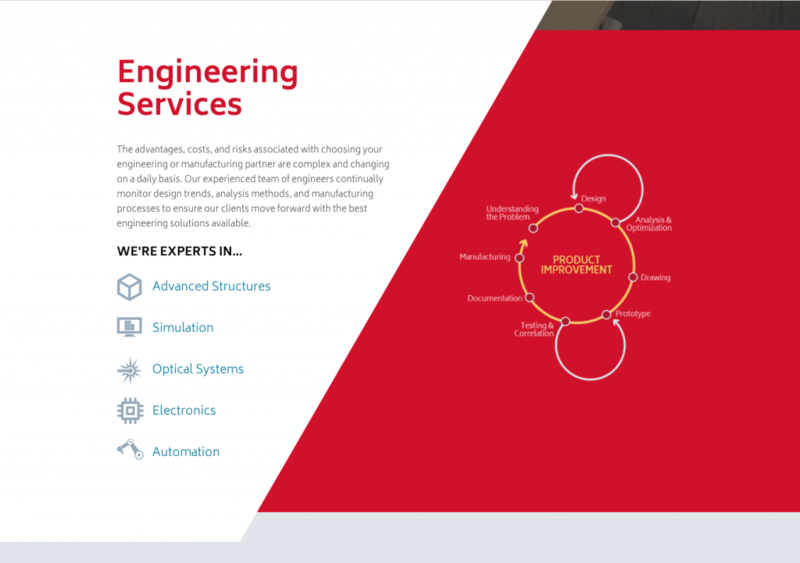 As mentioned above, we used strategic information architecture and user experience design principles to create a simple and informative site -- one that accurately communicates Quartus’s brand and capabilities, while providing the right level of information for potential clients in their search for an engineering partner. On the design front, PINT took everything learned through the discovery process to create a design language that gave Quartus the uniqueness they wanted while delivering the message clearly to the user. This included everything from imagery to illustrations that helped convey Quartus’ product improvement cycle. The design language and messaging were also expanded from the website to everything from PowerPoint templates and a revised marketing brochure to ensure cohesion at all points of contact. To determine the results of the project thus far, we have compared data from 60 days before the launch of the new website to 60 after the launch of the site. Overall, users are much more engaged with the new site. Bounce rates have gone down by 22% and mobile users have increased by 27%. PINT also made sure to set up proper redirects so that traffic levels did not dip upon launching the new site as is common for many website redesign projects. User sessions have increased by 4% and new user sessions have increased by 3% without any investment in ongoing search engine optimization or search engine marketing. Lastly, PINT has analyzed user flow analysis. 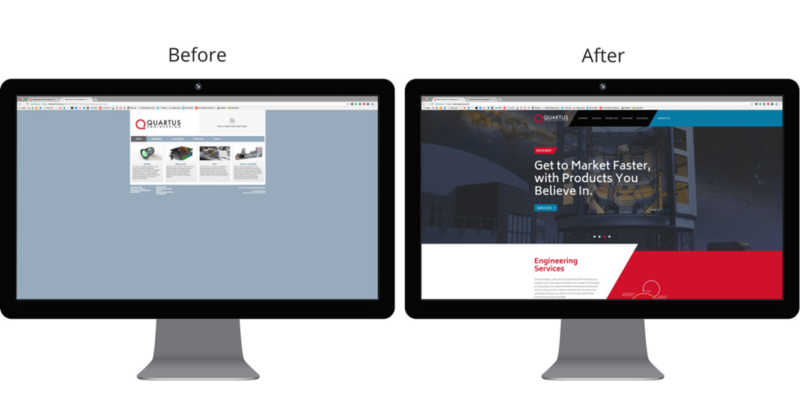 Homepage drop-offs are down 13%, through traffic to the careers page from the homepage is up over 500%, and capabilities interactions are up 75%. Tying back to the project goals, Quartus is now seeing more measurable engagement on specific sections of the website intended for the key audience groups: prospective clients and prospective employees. If your site doesn't communicate your businesses capabilities clearly, let us know. Our team will help you shape your messaging.